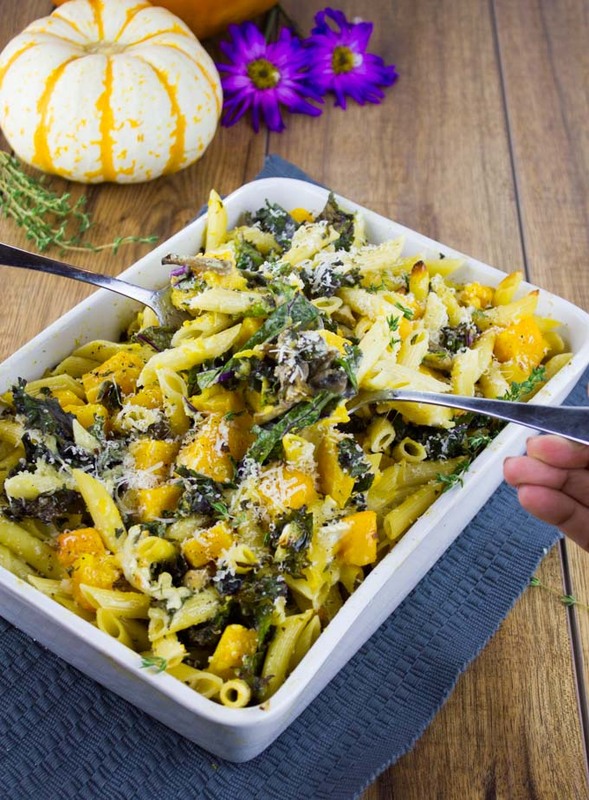 This Easy Baked Pasta with Roasted Pumpkin, Kale, Mushrooms and creamy Brie is a celebration of fall vegetables and the perfect vegetarian comfort food dinner on a cold evening. 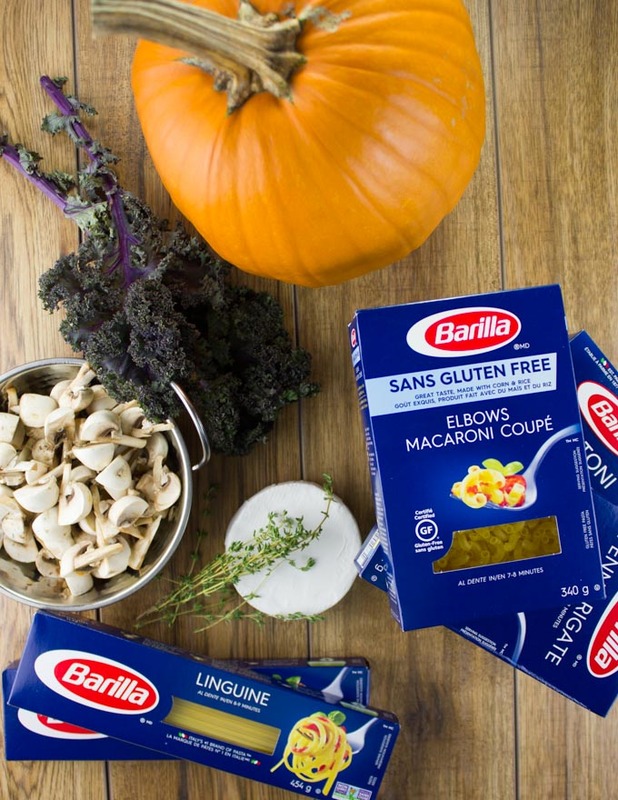 Today’s comfort deliciousness is sponsored by Barilla Canada — makers of high quality, tasty pasta that cooks perfectly al dente! All opinions are my own. Happy World Pasta Day! Yay! A day for the LOVE of pasta and LOVE of comfort food! I’m celebrating with a Vegetarian Pasta Bake: An Easy Baked Pasta with Roasted Pumpkin, Kale, Mushrooms, and creamy, rich Brie cheese. Now, the brie cheese is totally optional, but if you’re looking to indulge—go for it! This baked pasta is pure comfort and a perfect celebration of this gorgeous season on a special day! How are you guys enjoying Fall foods this season? I’ll admit that the weather has been so gorgeous, it took me a while to get into the Fall mood but now with all the gorgeous pumpkins and squashes on display, I am starting to get excited. Let’s talk a bit about this Easy Vegetarian Baked Pasta, because adding pasta to fall is like adding comfort to comfort food. I fell in LOVE with the combo of pasta and roasted pumpkin last year when I was asked to do an all things pumpkin cooking class. 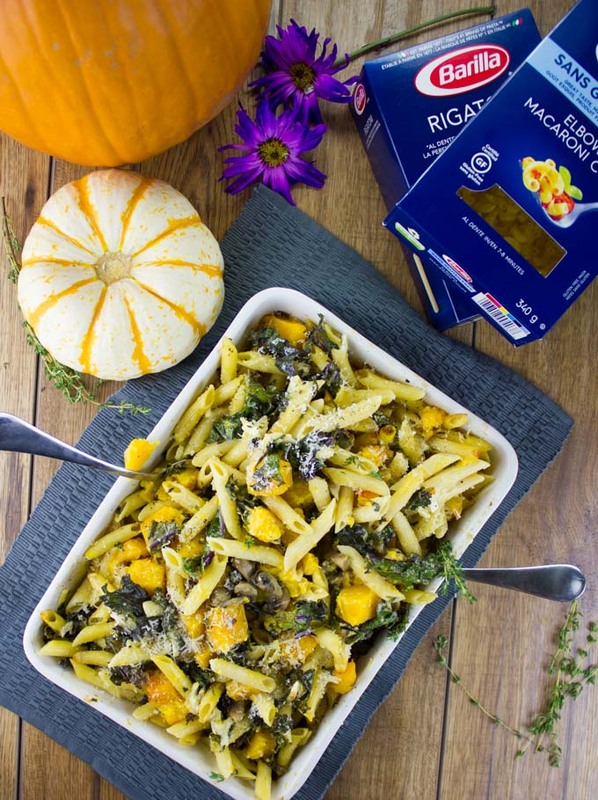 Amongst all the dishes we made, this Vegetarian Baked Pasta with Roasted Pumpkin was the clear winner! This Easy Baked Pasta has the sweetness and creaminess of a roasted pumpkin, so I love to contrast that with the slight bitterness of kale. The mushrooms here add a nice hearty, meaty flavor and a nice chewy texture to this Vegetarian Baked Pasta. Certainly, feel free to add in or leave out some of the ingredients when making this Easy Baked Pasta. Let’s start with the pasta. Because let’s face it, with a dish called Baked Pasta all about the pasta! I love Barilla for many reasons. It tastes really GOOD. Not too starchy. It cooks to a perfect al dente texture, and does so quickly! But at the same time, the pasta retains its beautiful texture whether boiled or baked. So let’s talk pumpkin. I find many of us use the canned pumpkin all the time because it’s delicious and easy, but the taste and texture of a roasted pumpkin is seriously unbeatable! 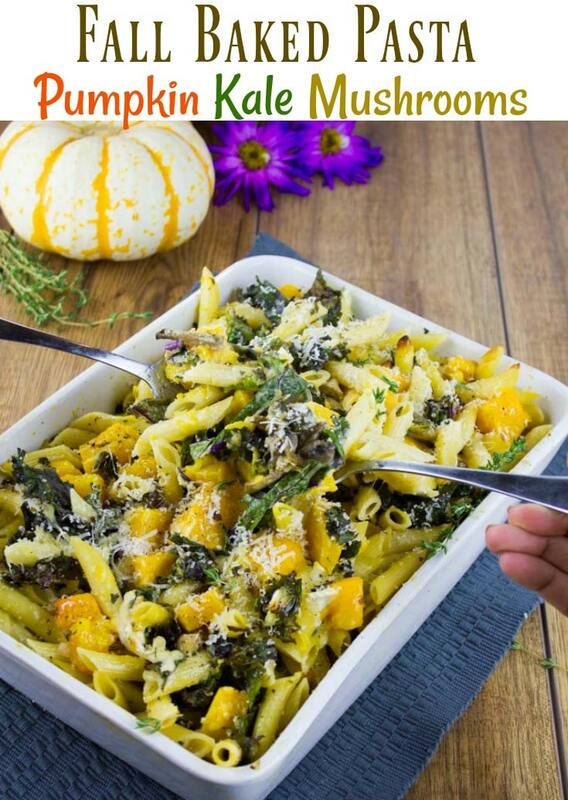 Now, for this Easy Baked Pasta with Roasted Pumpkin, you could easily slice the pumpkin or squash in half, remove the seeds and place it in a microwave with a little water and cook it for a few mins until the skin peels right off. Similarly, you can do the exact same thing but roast the pumpkin with the cut side down in a 400-degree oven for nearly 40 mins. Then simply peel the roasted pumpkin, slice and cut it up into the shape you like. I love adding quartered mushrooms along with the pumpkin to roast. 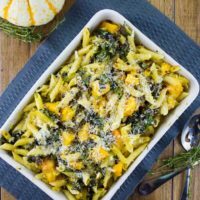 For assembling the Vegetarian Baked Pasta, I simply toss freshly sliced kale, the roasted pumpkin and mushrooms with slightly cooked pasta. Don’t forget to season! Now comes the good stuff: cream. Don’t skimp here! It maked this Baked Pasta dish so much more creamy and comforting. Brie slices on top of this Baked Pasta with Roasted Pumpkin are the perfect lush finale, though I have to say, it’s optional. Instead of heavy whipping cream, use light cream or even coconut cream. But don’t leave it out. Roasting the pumpkin in the oven gives it the perfect texture and additional sweetness, taking this Easy Baked Pasta to a whole new level. Cook the pasta about 3 minutes less than indicated on the package to get the perfect texture. Cut the pumpkin in half and remove the seeds. Place the pumpkin cut side down on a cutting board and use a veggie peeler, peel the skin off while holding the pumpkin with your other hand firmly. Turn the pumpkin as you go peeling it. Cut up the pumpkin into slices and then cut each slice into inch cube pieces. On a parchment lined baking sheet, add the pumpkin cubes and quartered mushrooms and season them with salt, fresh thyme and olive oil. Toss and roast them for 20-25 minutes until the pumpkin is tender. In the meantime, cook the Barilla pasta according to package instructions, making sure to remove it 3 minutes earlier as it will bake in the oven. In an oven-safe plate, about 9 inches by 1 inch and 2 inches deep, add the fresh kale, roasted pumpkin and mushrooms, cooked pasta, cream, seasoning and toss well. Top the pasta with some brie cheese (optional) and bake uncovered for 15 minutes. Instead of heavy whipping cream, use light cream or even coconut cream. But don't leave it out. Wow- this looks like supper!! So many flavors and healthy aspects!! Total comfort food! YUM! This looks so delicious! I definitely want to try it! What a unique dish! I fan just smell the autumn aromas from here! I like that this is a dish you can bake in the oven, then serve at the table … no need for extra dirty serving dishes. What a beautiful, healthy, and seasonal meal to prepare for my family! I love pumpkin, and this sounds like a can’t miss combo! All the best Fall ingredients! The perfect flavor combo for the pasta! Pasta is always a hit in our house! Yum! what a hearty pasta dish, perfect for cold weather. I can’t wait to give this one a try. This looks like an amazing dish to serve at thanksgiving for friends and family who are vegetarians. I would probably devour it too! 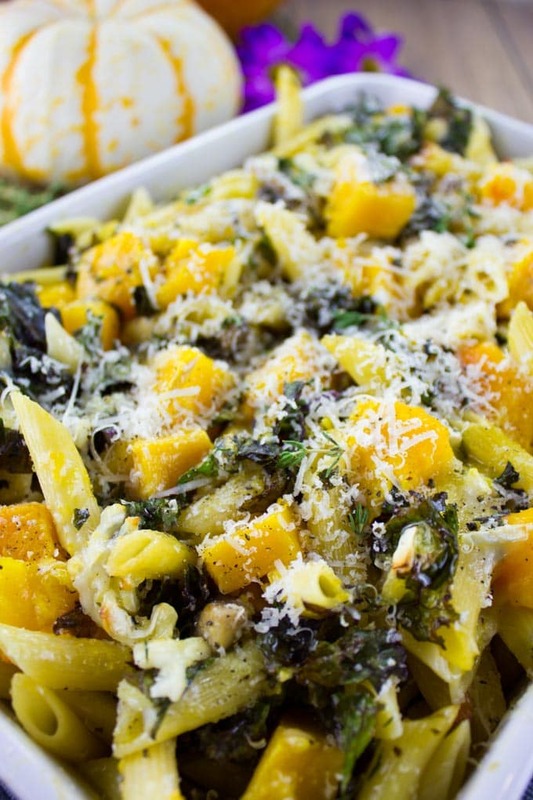 I don’t cook with pumpkin enough so this is a fantastic idea for such a delicious dinner! I love the kale in it as well, we are huge kale eaters so I always have that on hand! 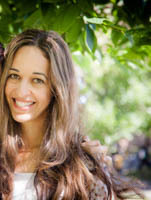 I have been searching for all kinds of recipes for the upcoming holidays. 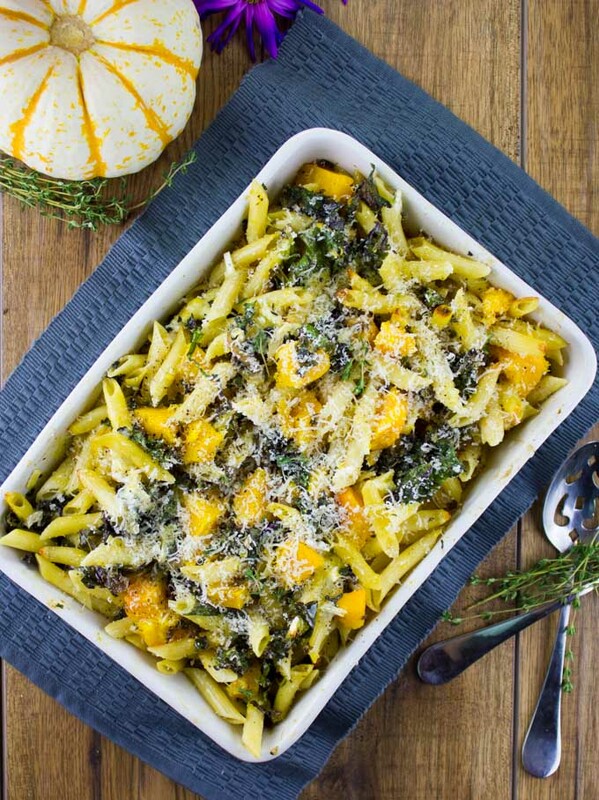 So when I saw this easy baked pasta with roasted pumpkin, kale, mushrooms and brie I got super excited – it is exactly what I need for this winter – thank you!